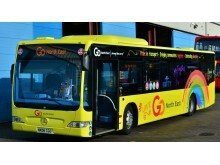 Newcastle will again come alive with colour for this year’s Pride festival and the region’s largest bus company, Go North East, will be proudly showing its support for the annual celebration with its two branded rainbow-emblazoned buses. This year’s LGBT event will take place from Friday 20th to Sunday 22nd July, with its annual parade through Newcastle city centre, as well as an outdoor concert at Nuns Moor Park featuring Alexandra Burke, S Club and Gareth Gates. For those looking to travel in style across the weekend, Go North East’s branded Quaylink Pride bus will be transporting revelers on the popular Q1/Q2 routes, from Gateshead Interchange to Newcastle Central Station. 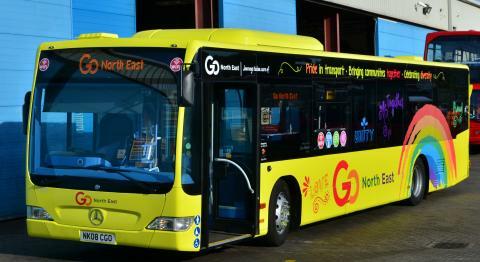 Go North East is committed to championing diversity in its local communities and last year, invested over £10 million in upgrading its fleet, including the introduction of its new Sunderland Pride bus. The brightly coloured yellow, rainbow-emblazoned vehicles bear the words ‘love, proud, carefree, unity and bold’ and the banner ‘Pride in transport, bringing communities together, celebrating diversity’ and were designed in support of events such as Newcastle Pride; the second biggest annual Pride event in the country.